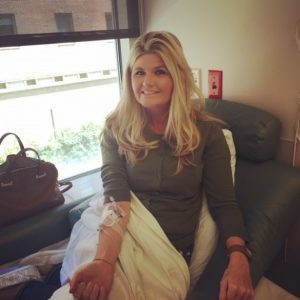 This blog post was written by Kristina Baum, who has melanoma and is participating in a clinical trial on immunotherapy at the Johns Hopkins Kimmel Cancer Center. For more information on Kristina's story, watch her interview with Denise Grady on the New York Times' Facebook page or follow her on Twitter at @kristinabaum. For the post, we asked Kristina to discuss what led her to join an immunotherapy clinical trial. When I was first diagnosed with melanoma in September 2012, cancer research was light years behind what it is now. When I was diagnosed this second time in June 2016 with metastatic melanoma, my oncologist, Dr. Evan Lipson, mentioned a clinical trial as my first option. Admittedly, the words “clinical trial” scared me. As I weathered cancer the first time, I remember patients going on clinical trials simply when they had no other options to consider. Clinical trials seemed like a last resort, or a type of lab rat experience when there was no other hope. However, as I gathered myself in the midst of the diagnosis conversation, I knew that Dr. Lipson and the team at Johns Hopkins were ones I trusted. Therefore, I knew there must be a good reason for their suggestion – and there was. By going with an immunotherapy clinical trial, I ended up having more treatment options than I had initially anticipated. We pursued a trial with Opdivo and an experimental drug known as a LAG-3 monoclonal antibody made by Bristol-Myers Squibb. There were a limited number of slots on the clinical trial provided to patients at Johns Hopkins and I received one of them, which was a miracle because that spot was not available the week before I was diagnosed. I eagerly learned about the trial, and quickly heard about the many successes patients were having with immunotherapies. Dr. Lipson, my family, and I were all very optimistic. However, bumps in the road occurred. As I went in for my third infusion, I experienced a side effect that occurs in less than one percent of patients known as auto-immune meningitis. Basically, I had a terrible headache and was completely oblivious to the seriousness of what was happening. I was admitted to the hospital and carefully watched by a team of doctors, including Dr. Lipson, and was later released on a strict regimen of steroids. The inflammation quieted, and I resumed normal life at work. Each week, I get lab work done to watch my numbers and to keep track of my progress. Then, on August 1, great news emerged. My very first CT scan since being diagnosed the second time revealed that the tumor in my left kidney shrank from 2cm to a smaller 7mm! No other metastasis were present either. The immunotherapy clinical trial was working! Pursuing the experience of an immunotherapy clinical trial no longer has the frightening stigma I feel that it once had. I would encourage any patient to pursue an immunotherapy clinical trial for a number of reasons with one being that a clinical trial might allow you to receive medications based on the most cutting edge, up-to-date, freshly researched cancer developments. One person encouraged me to not Google my cancer, as any cancer patient already knows, but for a different reason. Developments are being made in cancer research, especially at places like Johns Hopkins, at such a rapid speed that some articles or information that’s more than a few months old might well be out-of-date. Research in cancer immunotherapy is not only developing and growing quickly, but the word about its successes is spreading like wildfire. And I noticed that this “wildfire effect” is usually from the patients’ stories themselves. In other words, I was seeing that there were people out there with stage four cancer, just like me, who were achieving "No Evidence of Disease" results rather quickly through immunotherapy clinical trials. I was so encouraged, so hopeful, so inspired, and so sure that I had made the right decision. I also thought that in some small way, I could be a part of a choice group of people that hopefully help other patients that were like me, too. I imagined another young woman in her early 30’s receiving the news of a metastatic melanoma diagnosis. I imagined her, just as I had been, as scared, unsure of next steps, her family and career somehow unfathomably having to go on hold and the overwhelming thought of “how do you even tell your loved ones?” I imagined her flooded with emotions from the news of the word “it’s cancer” and the swirling survival statistics doing gymnastics in her mind. The truth is, with an immunotherapy clinical trial, there is hope. Your life doesn’t have to go on hold, but you do need to be careful and listen to your oncologist. And the support I received from not just loved ones but also the Hopkins family has made this road an easier one to walk down. It’s not a “cure” but it sure is evidence to me that we’re moving in the right direction.